In our investigations of the responses of shrimp, crabs, and oysters to infections with the pathogenic bacterium Vibrio campbellii , we have become interested in how a bacterial challenge can influence the performance of organisms in the field. One way to study this is to induce an organism to engage in some elevated activity similar to what might be encountered in the field. We have demonstrated that shrimp (in this case, Litopenaeus vannamei ) respond to the moving belt of a treadmill submerged in water by swimming. They are capable of swimming for hours. This will allow us to investigate how a bacterial infection can influence the ability of shrimp to perform. 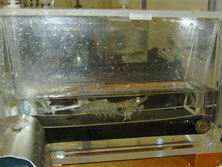 Click here to see a video clip of a shrimp swimming on a treadmill. This video was made by David Scholnick, Pacific University. The Atlantic blue crab, Callinectes sapidus , will walk on a treadmill elevating its oxygen uptake and producing lactic acid. We have designed a treadmill that is contained within a respirometer to measure oxygen uptake. 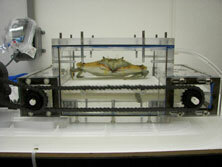 Click here to see a video clip of a crab walking on a treadmill. When it hits full gallop, it's enough to take your breath away. Especially if you're so transfixed that you've stuck your head underwater, to see its graceful movements more closely. That's just the kind of agility and vigour represented by...the noble shrimp. If you've never seen a shrimp run, well, that puts you squarely in the majority. But as recent research vividly demonstrates, these crustaceans are capable of more than just wearing a delicious coat of golden-brown batter. In fact, they're capable of running on a treadmill. The flipside of that information? Scientists are capable of building a treadmill on which shrimp can run. Dr. Lou Burnett is one of those scientists. We reached him at the Grice Marine Laboratory, in Charleston, South Carolina.